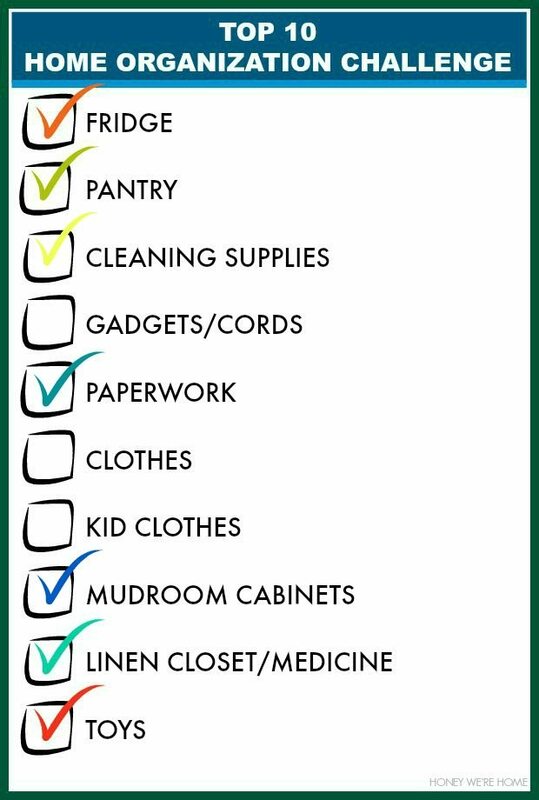 I managed to check off two more organization challenges this weekend, the mudroom cabinets and the cleaning supplies. I decided to make this into one post since these two chores weren’t all that taxing. The biggest part of digging in was just getting started. I kept putting it off, but on Friday night I actually decided to “just do it.” Once you get going, you build momentum and then seeing the progress feels so good! I decided to start this off with the finished “after” photo since I didn’t want the first picture on this Monday to be all our chaos. 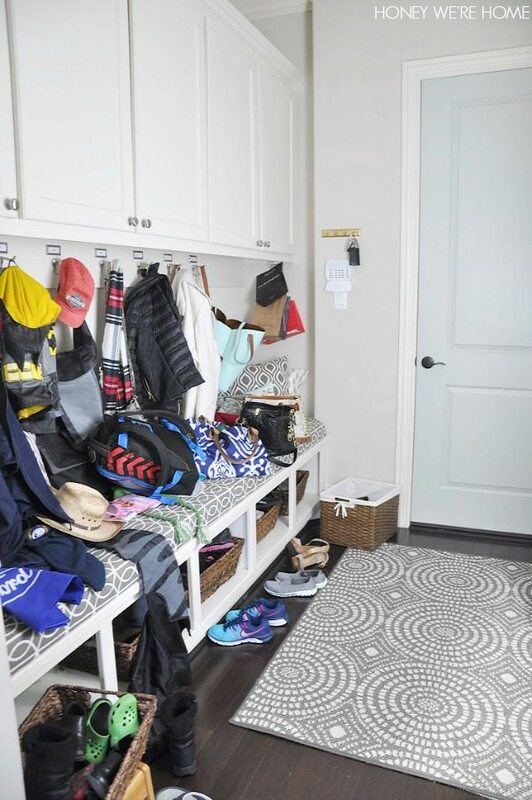 Our mudroom is one of the hardest working rooms in the house, holding all of our jackets, bags, backpacks, sport bags, shoes, and gym towels. 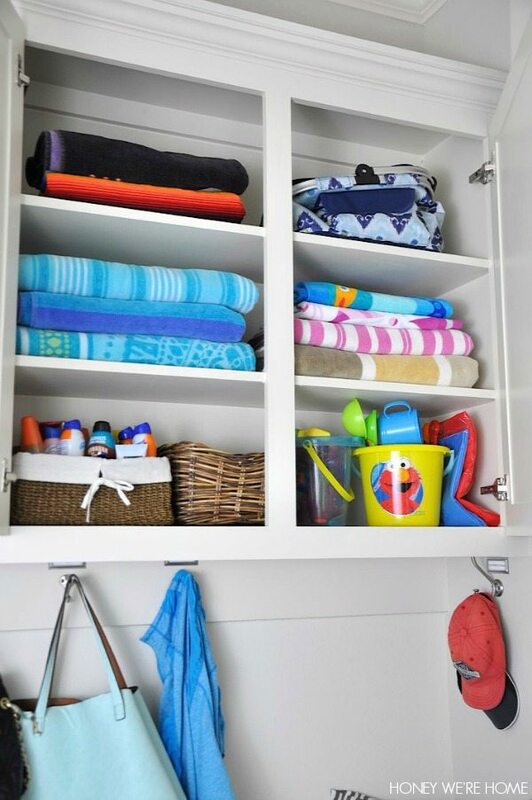 We’ve got lots of hooks to hold the hanging things and baskets down below for shoes and more hats. Everything gets dumped here as we walk in the door through the garage. And with our crazy Houston weather, I’ve had different weight jackets on hand and various scarves. I keep returns here and that extra bin by the door holds our gym towels. Of course, I started with pulling everything out, and returned some shoes, jackets, and bags to the closet. Not sure where all this dirt came from, but I used a mini broom and then the brush attachment of my vacuum to clean it out. And finally the mudroom can breath again. I should keep up with it better by clearing it out every few weeks. Otherwise, things just accumulate. The cabinets weren’t that bad to clean out. Mostly there was just some things to trash and then reorganize our lightbulb storage into a basket and rearrange the summer stuff. The only “problem” with this extra storage space is that it’s so high, that it’s hard for me to access easily. That’s why I don’t keep much on the top shelf. That rolled paper on top is the architectural plans to our house. I can’t wait till we get to actually use those beach towels again. This is our entire collection and most we’ve had forever. 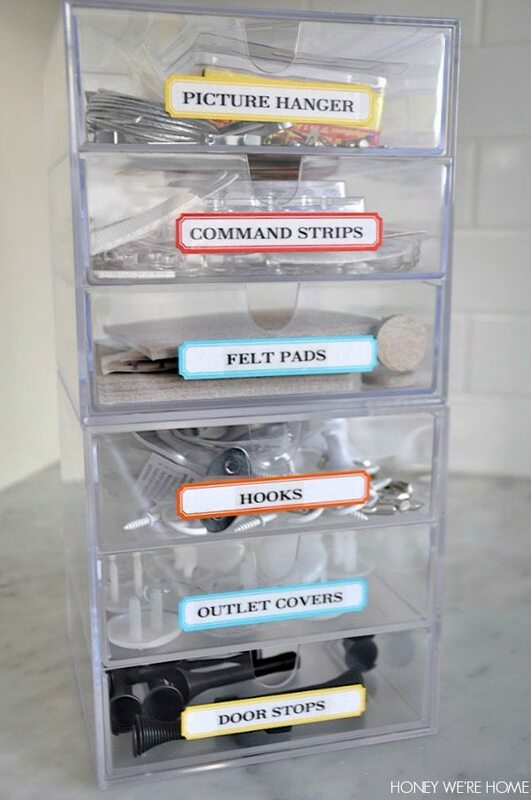 One of the best things I’ve done as far as organizing was to put all the little things that don’t seem to have a home in these small acrylic drawers from The Container Store. You’d be surprised how often I’m reaching into one of those. James used to chew and play with the door stops as a baby, so I started collecting them so we’d still have them later. 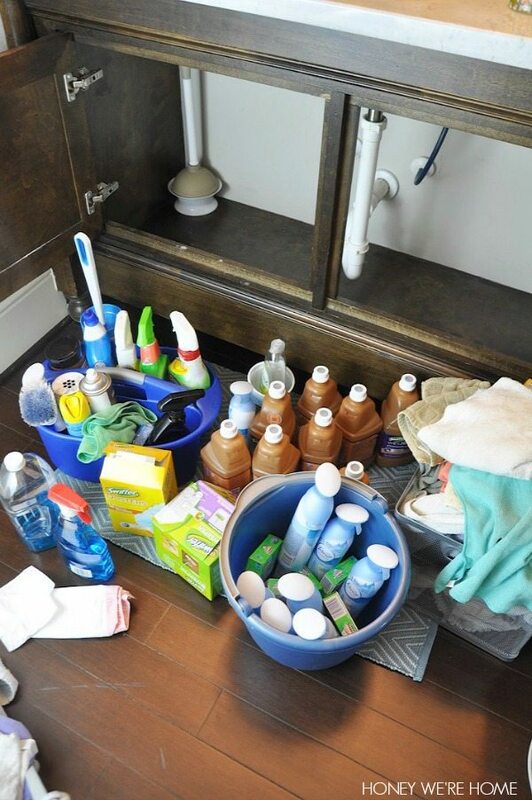 Most of our general cleaning supplies are stored in our downstairs bathroom. I’m always forgetting what I’m out of and also used Amazon ‘subscribe and save’ so I got one too many shipments when I forgot to cancel. The subscription service is supposed to simplify your life so things you use often are on automatic, but the drawback is when you forget to cancel, then you end up with too many. To simplify for now, I cancelled all my subscriptions. This area wasn’t too bad for a cleaning supply closet, just needed cleaning out. 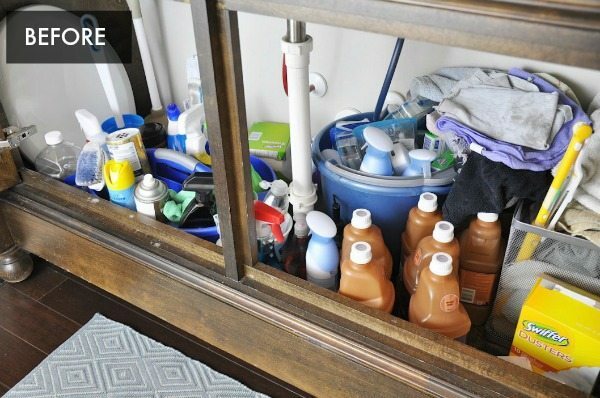 After it was all organized, I realized how many unenvironmentally-friendly cleaners I use. What natural products have you found that you love and that really work? I know some people make their own and I should try that. Whenever I pull out the vacuum, my son wants to help. Wonder how long that will last?! I had to toss some things and get rid of that broken toilet seat. Not sure why that was still in there anyway. Then, I just grouped everything together and folded the cleaning towels neatly. So happy to have two more organizing projects finished! Only 3 more to go! Ha, I have the same dash and albert rug in our kitchen and by our back door. We use Seventh Generations products. Love that they offer most in a free and clear version. I also love that they now offer tiny concentrate bottles for refills. Just add to your existing bottle, add water and you are done. So much less packaging and waste. I love their natural glass and surface cleaner. Works well on most surfaces. And, they wood cleaner smells amazing. I am thinking about trying some of the Honest products now that Target is carrying them. Thanks so much for your suggestions. I definitely need to try them. Hope you're having a great Monday Lauren! Love how you are getting everything organized. I need to get on that wagon! I started using Shaklee a few years ago after I started getting sinus headaches after I cleaned. I LOVE It! I use the Basic H for almost everything, and the Basic G for all the germy stuff. It lasts forever! And then there is the wonder paste, Scour Off…it is amazing! Hard water stains, porcelain farmhouse sink, I even use it on my All-Clad pots/pans. Would not use anything else. I know the Seventh Generation are supposed to be good, but I can't get past the awful smell! 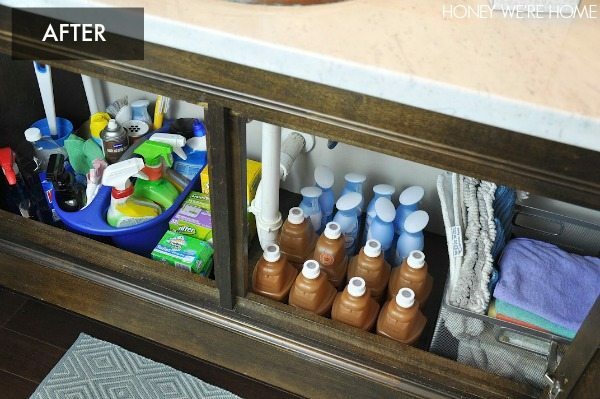 I use a white vinegar and water solution for almost everything! There is a slight vinegar smell, but it dissipates quickly. 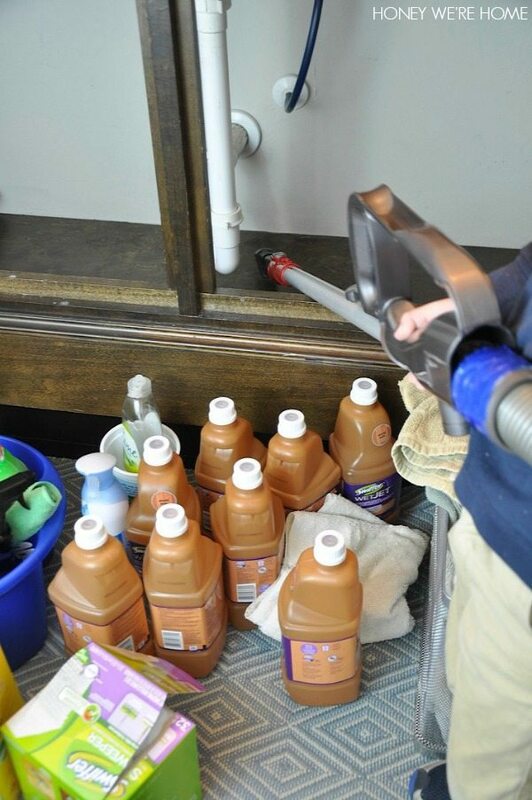 No residue of sticky product is left behind that can collect dirt. It especially works well on glass. Also, if you have glass shower walls, using a squeegie on them after each shower will clean the glass so that it's always clear! I'm becoming a bit of a germaphobe as I get older and the vinegar and water solution is a good disinfectant and mildew inhibitor! 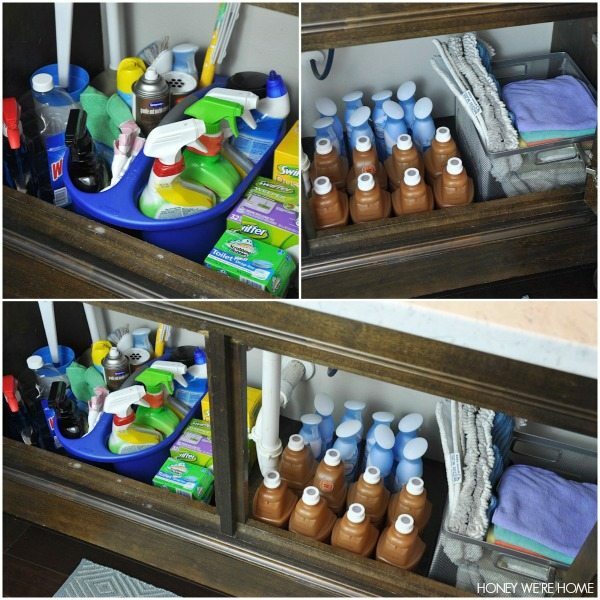 Google cleaning with vinegar and you'll see all the wonderful advantages…. and its so cheap!!! This looks great! 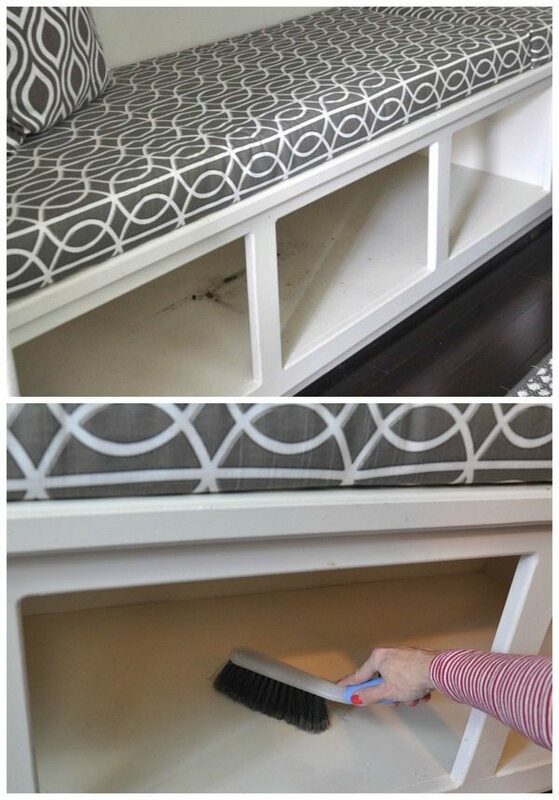 It's amazing how a quick clean out can make you feel so good! 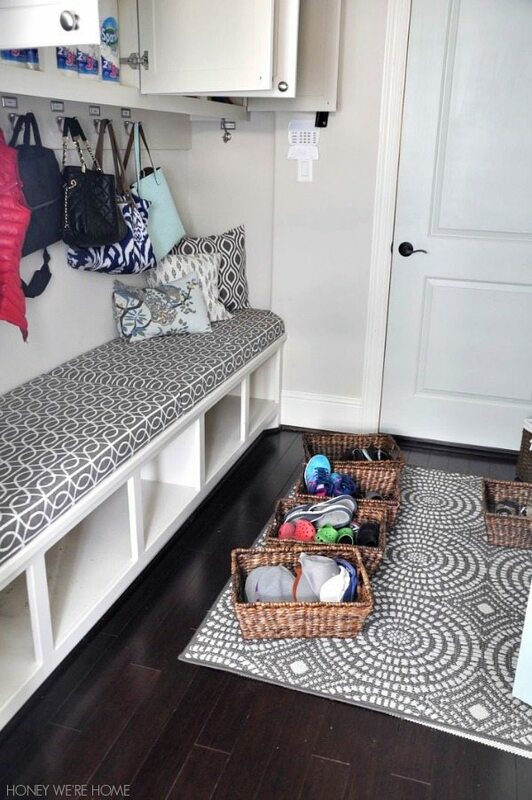 I actually have our laundry room/mudroom on our weekly cleaning rotation, just like every other room. Between the lint from the dryer and the leaves that blow in as we come and go, it really needs a quick weekly wipe down. I'm just starting to think about switching over my cleaners. My first step was to make homemade laundry detergent. it was cheap and easy to do, and i've been very happy with the cleanliness of our clothes. Oh, and I started to use vinegar as fabric softener when i read that they could tell what kind of fabric softener you use iwth a blood test…it absorbs into your body from being on your skin all day. Yikes!!! Looks great! Mine always starts looking cluttered weekly!! I have that same rug. What pad do you use under it to stay put??? I like 7th generation, method and babyganics as well as honest company. I stopped using a lot of chemical products when I was pregnant. It looks fantastic Megan! You are on an organization roll! You inspire me. You've got the cutest little helper there, too. Happy Monday! It looks great! I like the all purpose cleaner by Ms.
Meyers from Target. You just mix a bit with water and use it on countertops, floors, etc. It's environmentally friendly and the basil one smells divine! We are huge vinegar users and Honest Company goodies. I LOVE those little drawers for little things. I have turned my house upside down looking for my felt pads. This is what I need! I second using vinegar virtually on everything: stainless steel, granite (though some people say it granite, I haven't found it to be the case), ceramics of course. Megan, I am so with you on the tall cabinets. 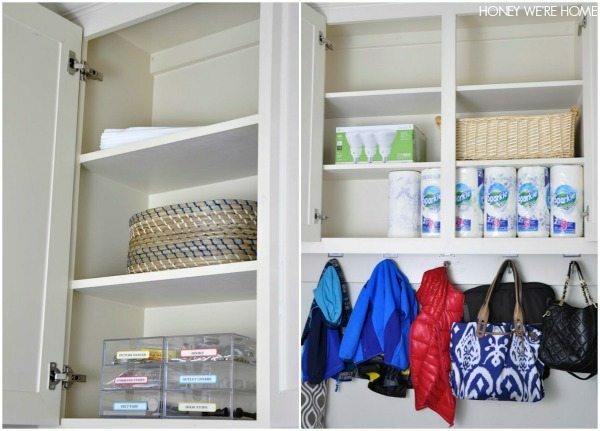 I am short too, and I almost never use upper half of most cabinets in my house. I put "rarely used" items there, which means "never used" items, seems wasteful. Great work! 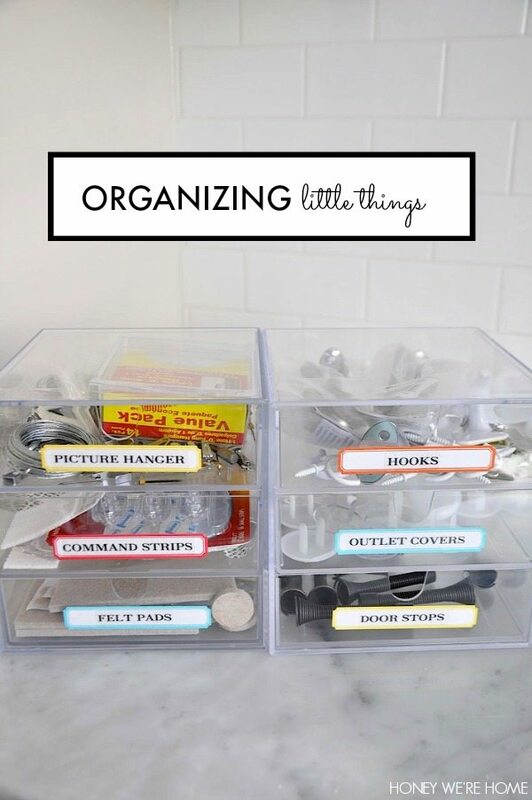 I have clear storage containers for the 'little things' too & they are a lifesaver! I've just started making my own natural cleaners- pretty easy to do & they actually clean a lot better I find. Otherwise, method products smell great and are all natural! You are soooo organized! Great job! 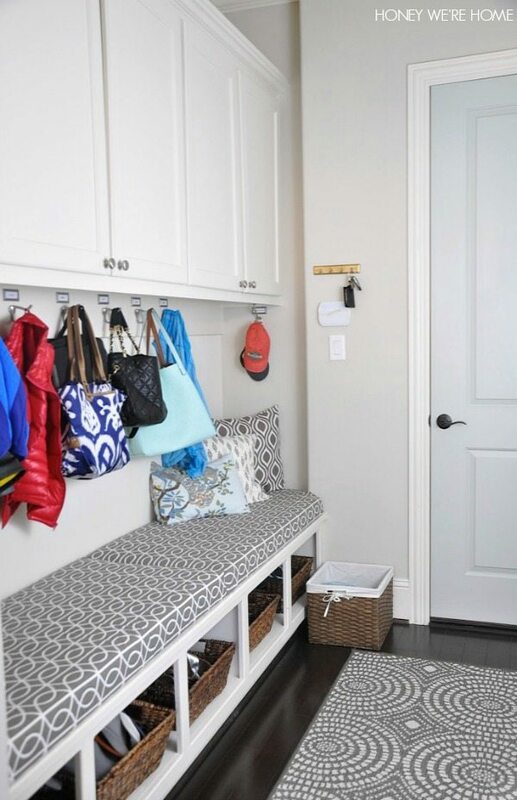 Good job on getting your mudroom organized. Most high use rooms need a quick clean up. As for cleaning products, I like the Earth Friendly Products brand. 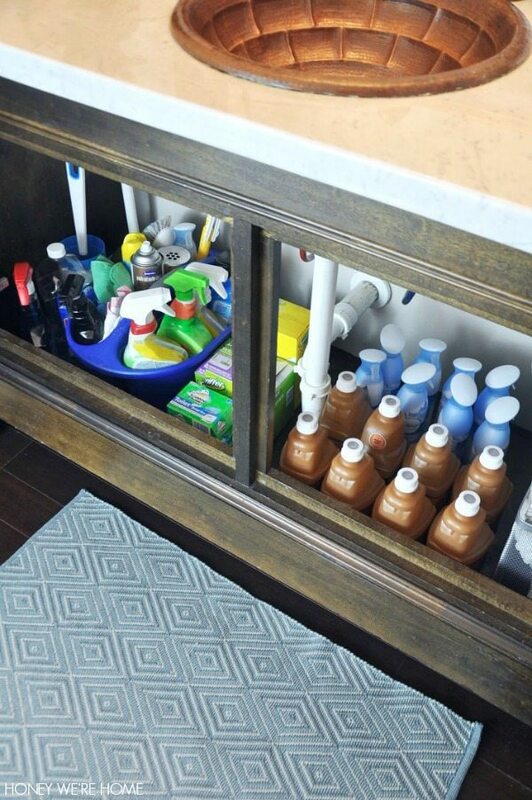 I use most of their line including the Ecos Free and Clear laundry soap, OXO Brite (color safe bleach), Stain and Odor Remover (spot cleaner and for pet stains), Dishmate Free and Clear (dish soap), Wave (dishwasher) along with their furniture polish, toilet bowl cleaner and furniture polish. The dish soap is plant based so their website says it can be used as a liquid hand soap (you can't do this with normal dish soap). I like it because it's fragrance free and it doesn't have any triclosan or any other toxins in it. Overall, I like most of their line. I used to buy it at Whole Foods but ironically, the best price is at Walgreens.com so I have everything delivered except for the laundry soap. The Dishmate (dish soap) was $3.99 at WF and it's $2.99 at Walgreens.com and when Walgreen's has their internet sales, I can get nearly everything for almost 50% off of WF prices. I order from Walgreen's.com once a month just for these products. Best price on the Ecos laundry soap is at Walmart $8.97 for 125 oz. Most stores only sell the 50 or 100 oz and they sell for $12.99 and up. I also like that they have a lot of products that do not include any fragrances (which are toxins) so I tend to purchase as many "free and clear" products as possible. I also steam clean things to reduce using any toxic products. I still use baking soda to clean sinks and vinegar and water (as a glass cleaner) but with the granite countertops in the kitchen and travertine in the bathroom, I can't use anything acidic like vinegar. I just use a granite cleaner by SCI that makes everything shine but I don't think it's environmentally friendly. I try to pay a lot of attention to all toxins and will use as many green cleaners as I can. P.S. Good job on the weight loss. Wow! Wonderful article!! You are so organized dear. 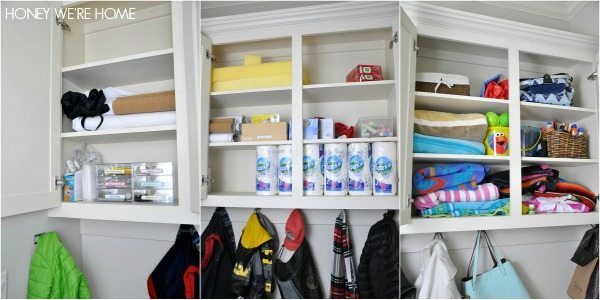 How amazingly you did the entire house cleaning work!! I am impressed from your methods. I would love to follow your schedule for cleaning my home. 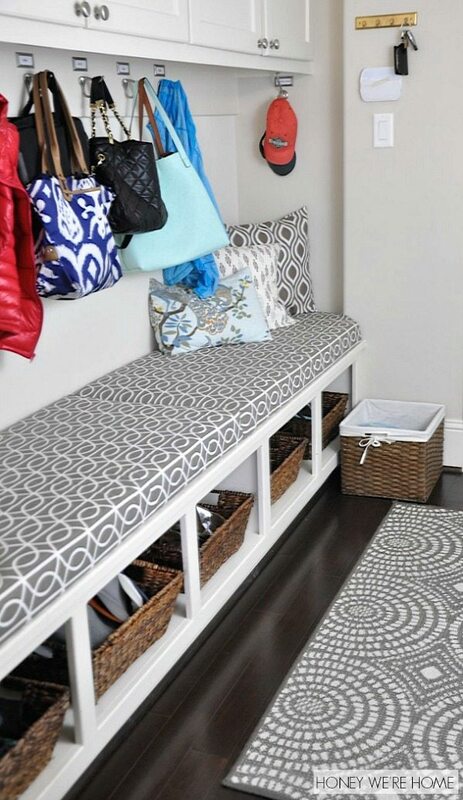 Was wondering where you purchased your bench in the mud room?? . I think it looks and works great for you family’. Interested in acquiring a bench like yours. Thanks for your lovely posts.